The idea of a page flipping eBook, with high quality coloured images and graphics makes a valuable resource in diverse applications. From children’s books or graphic novels to study materials; or a decorated photo album, with the help of the Flip PDF software, the power to create meaningful “photo books” is in your hands. You can do this using your Windows or Mac desktops in a matter of few minutes, here’s how. 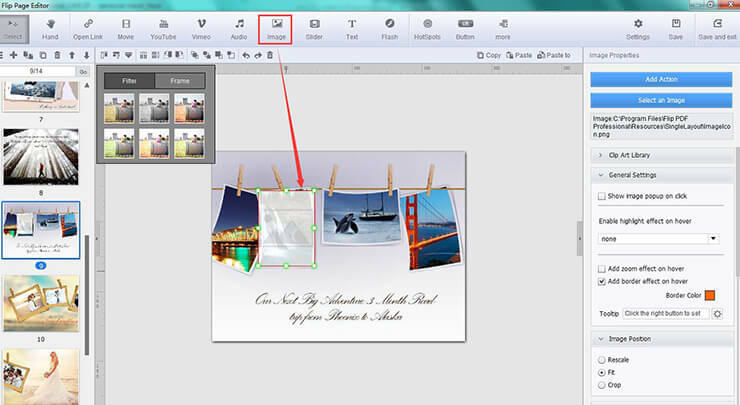 Before getting started, first bunch your images together in a PDF file. Now, launch the Flip PDF Pro software in your Windows or Mac desktop, and in click on the “Import PDF” button to instantly make a flipping book out of the PDF. The layout of each page in the PDF file, will be converted as it is into the flipbook. Now, you can design your book in a way to make it more magical. To bring in some magical elements to your photo book, go to the “Edit Page” tab in the main window. 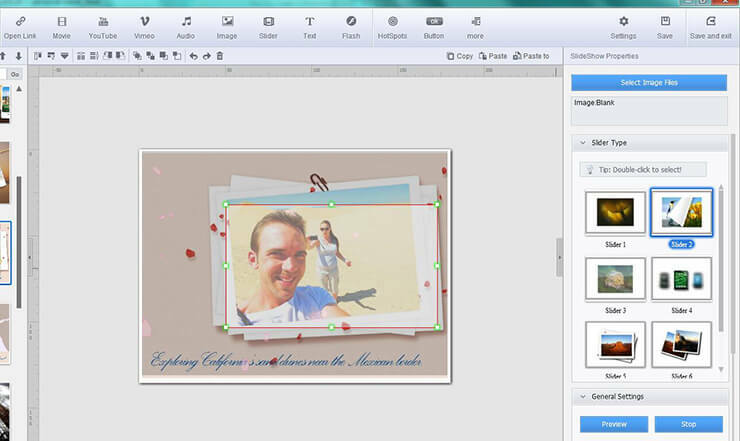 There are plenty of things you can create for a photo book, with the help of the Page Editor. Below is a step by step process of doing it. Use the “Add Link” option to insert a link box, anywhere in the book; or, use the “Add Image” option to insert image boxes. 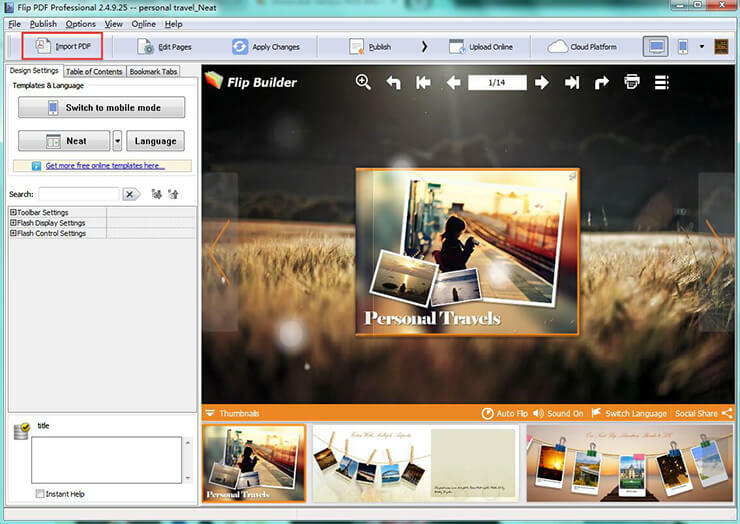 If you wish to add as a “Slideshow”, then go the “Action Options” and set the option as “Photo Slideshow”. The software supports image file formats of .jpg, .png, and .bmp. 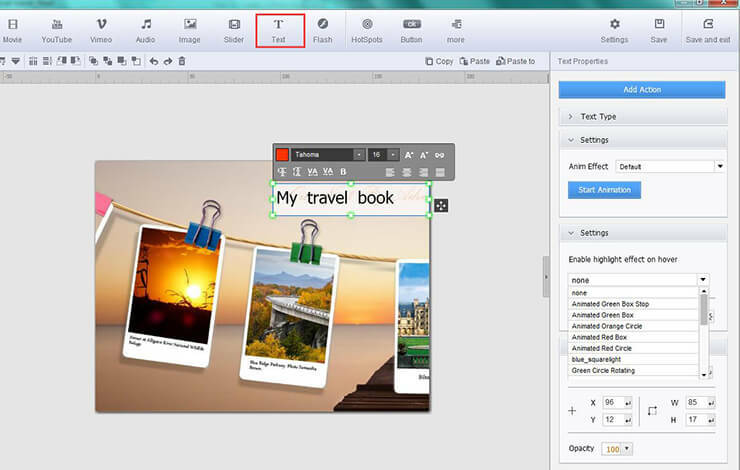 Finally, hit of “Save”, and then “Convert”, to output your Photo eBook, or Photo Book, with the flip through element. You can add textual content in various styles of appearance which includes plain text to caption an image, callouts for information, animated text and star words text for drama, dynamic text that scrolls up, as needed in featuring end credits. You can get all the icons in the Text section, and then in the “Text Properties” section you can edit your desired text layout. There are multiple fonts, font style and colours to choose from. You can do so much more to your feature, with essential special effects, you can use to create decorative wedding albums, an impressive photography portfolio, a magical children’s book, or an interactive encyclopedia. Go to the “Image Displayer” section, and choose from “Embedded Slideshow” ; Alpha Transition banner, that adds a transparent value to your slideshow; Carousel Viewer, that flips your book like a carousel with a background and image border; Add a Clip Art, to insert a character whom you want to narrate your story, or use the Banner Effect if your book is, a Banner. If you find a few photos in your photo book are misplaced or are out of context, you can rearrange them to suitable order, just drag and drop that image at another suitable place in the book, or go to the “Arrange” option, and “Add” the same image at your desired place, and delete from the inappropriate space. That simple! 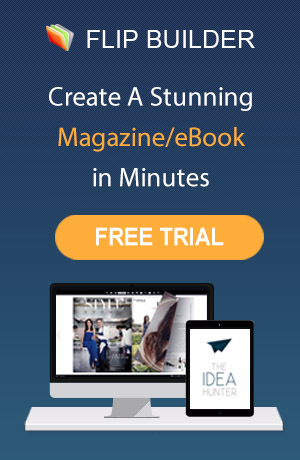 Simply click on the “Publish” option to launch your photo book in your computer. Select from file formats of exe./ html./ app. You may also choose according to the Plugin you wish to publish on directly to WordPress/Joomla/Drupal modules. 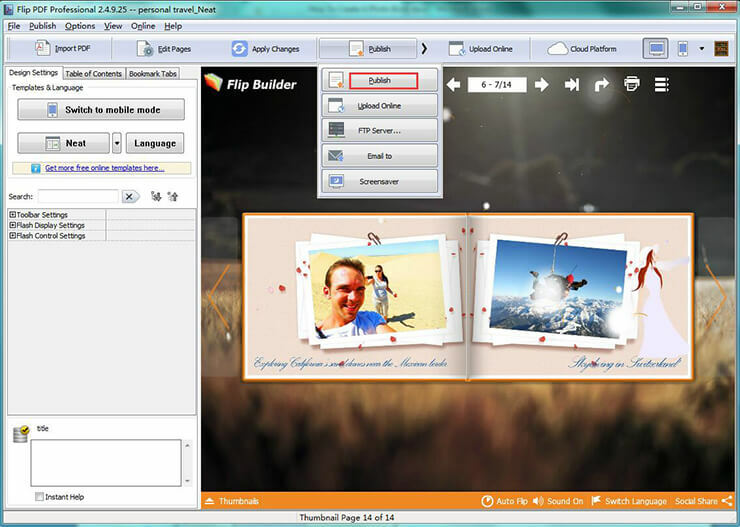 You can also use the “Upload Online” feature to publish your photo book into the cloud platform of your Flip Builder account and share or email from there upon.